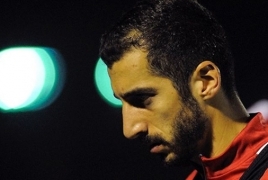 PanARMENIAN.Net - Armenian midfielder Henrik Mkhitaryan's Arsenal future is in doubt. The Gunners are keen to offload the midfielder as well as German international Mesut Ozil this summer as they try to reduce their huge wage bill, Irish Mirror says. Mkhitaryan is one of Arsenal’s highest earners on £180,000 per week, and only arrived last January. But, as with £350,000 a week World Cup winner Ozil, new boss Unai Emery believes Mkhitaryan’s salary could be better spent elsewhere as he bids to reshape his squad. Arsenal’s finances are strained with their wage bill, in particular, inflated. Emery was restricted to loan signings in the January window and could start the summer with a transfer budget of just £45million if Arsenal fail to qualify for next season's Champions League either with a top-four finish or as Europa League winners. The confirmed free-agent departure of Aaron Ramsey to Juventus , Petr Cech’s retirement and Danny Welbeck’s likely release will help, but says finding buyers for 30-year-old Mkhitaryan and Ozil, who turns 31 in October, will go a long way to significantly easing the burden, the source says. The Armenia international joined Arsenal in the swap deal that saw Alexis Sanchez head to Manchester United. Despite the size of his budget, Emery is targeting up to four signings this summer, with a left-sided winger his priority. Left-back, where Celtic’s Scotland international Kieran Tierney is in his sights, central defence and central/attacking midfield are other positions the Emirates chief is keen to strengthen.